Our OPENING TIMES are listed below on the blue link which will bring you a copy of our flyer with the information you need. ​We do have events on through the year however so make sure you double check below on the left side of the page in theNEWS FEED for any dates we are close for special event to avoid disappointment. All evening sessions are OPEN as normal unless stated as CLOSED above ^^^, the afternoon sessions (Derby city council school holidays only ) Monday to Friday 12pm till 4pm are £5.00 Admission & £2.50 for Skate Hire. We have a cafe on site serving fresh food and drink both hot and cold. It is against company policy for YOU to consume your own food and drink on OUR premises so we politely ask you to keep your own food and drink at home or in your cars. ALL food and drink purchased from Rollerworld must be consumed in our CAFE area ONLY in the interest of Health & Safety. Rollerworld Derby, the best place for a family day out where children have fun while their parents relax or better yet why not join in the fun and burn some energy off at the same time. All our weekly sessions are family friendly and there is no real restrictions on age. The smallest skate size we do is a junior 10 however we do have plenty of fischer price style skates that children can wear with their own shoes and we have seen children as young as 2 years old with skates on their feet. 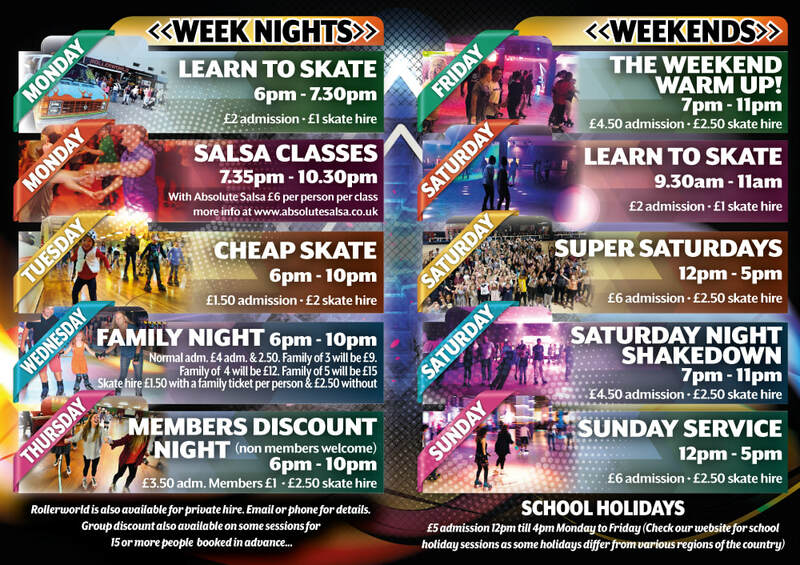 We have special events such as Salsa on a Monday between 7.35pm and 10.30pm and family night between 6pm and 10pm. For those who are new to skating we also hold special Learn To Skate sessions on Mondays and Saturdays. For more details on our weekly sessions click here. Apart from our usual sessions we also hold 3 All Night Skate events per year for over 16's to enjoy, with a late bar (Over 18s only) and a great DJ line up. The music and atmosphere at these events will leave you with memories you'll wish to revisit again and again. Rollerworld is also available for private hire events. Contact us for details.